Three spaces within our two adjoining properties at St. Ann & the Holy Trinity are available for use by outside groups. Photographs of available space can be seen here (link to a gallery). All inquiries should be directed to the Facilities Manager at 718-875-6960 or use the form below. Sanctuary: The architecturally rich and historic church sanctuary is an attraction in itself. The entrance is on Clinton Street, at the corner of Montague Street and is wheelchair accessible. The acoustics of the church are excellent, with seating for 750-800 people (including two balconies). The sanctuary is 145 ft. long, 80 ft. wide, 63 ft. high and includes a separate organ gallery over the front entrance. The variety of recent uses includes: feature film and TV production, concerts, theater performances, readings, community events, and weddings. Parish Hall: Connected to the sanctuary, the newly renovated Parish Hall is located on the ground floor of the Parish House at 157 Montague Street and is wheelchair accessible. With its arches and magnificent windows on the north and south walls, the Parish Hall has a distinctive charm. The room measures 100 ft. by 50 ft. and is an all-purpose, flexible space, with kitchen and restrooms. It can accommodate 150-200 people depending on the proposed use, and is suitable for wedding and receptions, meetings, performances, screenings, and holdings. Community Room: The Community Room is up two flights of stairs on the second floor mezzanine of the Parish House at 157 Montague Street. The comfortable all-purpose room has an elegant, arched south-facing window and a private bathroom. It is ideally suited for gatherings of up to 20 people. 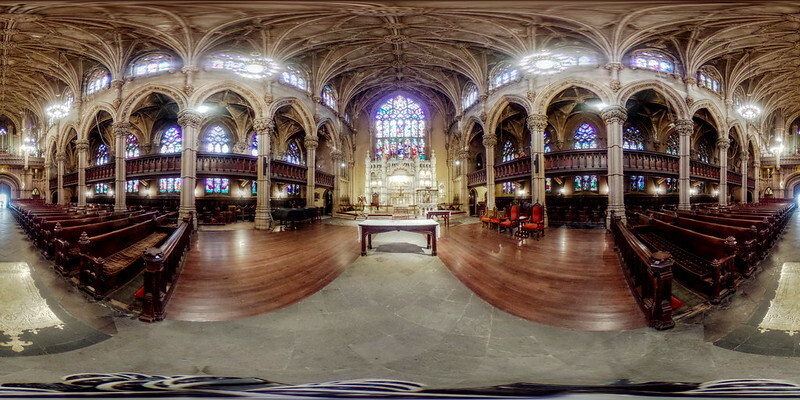 Take a 360° panoramic tour of the interior of St. Ann & the Holy Trinity Church as it is today. Jeremy Seto made this 360° panorama of St. Ann & the Holy Trinity Church’s interior on a May 22, 2016, visit to the church and has generously shared it with us.